I am presenting at the Social Thinking Provider's Conference today in Minneapolis and wanted to share this weblist of supporting resources with participants (and you). If you follow my posts here, you know I have a strong interest in social learning, and I am always looking for ways to engage my students in developing social cognition. Video is definitely an engaging medium to help students discuss social interactions in context. The problem with finding fun, engaging video is, well, finding it and knowing the timing of clips, etc. The problem with many video modeling products on the market, although there is a good evidence base behind these products, is that they don't engage (especially high-functioning) students very much and....zzzzzzzz. Enter Flummox and Friends! Flummox and Friends is a video (currently available for free, and hopefully a series, currently there is just the pilot) available on the web and EASILY playable on iPad or other devices, relating the adventures of a group of somewhat socially-challenged scientists and their neighbors, who aren't all that socially adept, either. Notably, the series was created by a parent of a child on the spectrum, Christa Dahlstrom, along with two SLPs, Jordan Sadler and Liesl Wenzke Hartmann, who developed the curriculum addressed in the videos. The pilot episode involves a party that doesn't quite go as planned, based on various problematic social behaviors involving "Tuning In" to the group. The episode is well-paced, funny, and subtle enough that you can use it with a group and have them identify exactly what is going wrong, but the episode also features the characters processing (and even singing and dancing about) the target skills and strategies that they will remember to use next time. In addition to the live-action segments, there are several animated components adding additional entertainment value and opportunities for discussion. Think of it as an Electric Company for social interaction. I especially liked the animated segment in which real kids discuss their own challenges with "tuning in" to others in a group. The creators provide a nice professional guide to Flummox and Friends on their website. Also, as I am trying to coordinate the use of this resource among our staff, I made a quick-and-dirty map of the episode with good stopping points and discussion topics to use with kids. In addition to the suggestions in the guide, this episode presents a great opportunity to develop narrative language and social comprehension with tools such as Story Grammar Marker. I hope you'll give this resource a look and spread the word, so that the creators will soon give us an episode 2! Check out their Facebook page, Twitter feed or mailing list for updates (links all on site). Just want to spread the word that I am again teaching the course "Tech Links to Language Interventions" through EDCO Greater Boston Collaborative this October. This is a hybrid class with one face-to-face workshop day on October 11 in Waltham and a month of follow up activities online (totaling 2 days time, all said). I taught it last spring and it was a lot of fun! One graduate credit through Framingham State College is optional, though the online component is now required by EDCO. This workshop will review strategies and frameworks for integrating desktop and mobile technology into language interventions and language-based teaching. Participants will practice task analyses and other strategies for identifying, applying, and cataloguing relevant web, desktop, and mobile applications, as well as designing pre/post activities related to student learning goals. Special emphasis will be placed on using web and mobile apps for creation of multimedia content for improving expressive, receptive and social language skills. The online component will include analysis of additional resources and creation of a project plan. Participants will review professional articles and related to the use of technology and curriculum integration in language interventions, participate in discussion forums, and independently identify and analyze resources for use in instruction. Create an exemplar for your students demonstrating a targeted instructional objective through narrative form. This could include narrative structure, vocabulary, social skills, curriculum connection, or another language objective. Post a link to the project or, if it's on iPad, you can either give a description of what you created or post a screenshot from the iPad. Describe how you would use the resource (procedure and objectives) in a short (5-6 sentence) paragraph. Respond to one of your colleagues’ posts as part of this assignment. I used Domo Animate to create a video relating to "reading a room". I work with many students with ASD at the middle school level, and many have an objective such as, "student will use nonverbal clues to read a person, situation and context, and respond appropriately..." Ih ave created many visual supports to facilitate success in this area, often using Boardmaker pictures to do so. Using an animated tool like this takes it to another level and (hopefully) lets the students see it in "action". We have also used video modeling extensively, which has been great, but I view using this tool as a companion piece and additional support for the complicated task of reading a room. I also imagine having the students help to create additional videos addressing the same skills but in varying contexts; this would allow them to be a part of the process, be motivating to hem, and help with generalization of these skills. Incidentally, I considered adding background music but decided it might be too distracting for my population of students. What to do with that SmartBoard? As you start your new school year, you may find yourself having access to an interactive whiteboard (IWB), either a SMART or Promethean board, or perhaps even another brand such as an ENO. Maybe you have one in your treatment room, or are working in classrooms where these boards are available. "Available" may seem like a complicated word to use, because you may not know what to do with the board, and are prohibited from writing on it with whiteboard markers, leaving you with perhaps a lot less visual space with which you can support your students. Well, there are a couple of simple ways you can reclaim that space and take your therapy activities to a new level if you have an interactive whiteboard available. 1. Use the IWB as a way to, well, interact with interactive websites. The IWB-equipped classroom you are working in likely has a computer available, or else there isn't much point to having an IWB. The simplest thing you can do to take advantage of the IWB is to use available (free of course) interactive websites onscreen. When you or students touch the board, you will be able to complete the activities at sites such as PBS Kids or BBC Schools. Tools such as the Smart Pens can be used to highlight and annotate the screen, so even if you choose something non-interactive, like just displaying a giant picture you find on Google Images, you can interact with it, label it, and break it down in language-based ways. If you would like to do this on your own computer brought into the classroom, you'll just need to ask your IT specialist to install the free software that allows you to interact with the board. Laptop connected to interactive whiteboard with interactive website Kerpoof. You can use any interactive website or Web 2.0 creation site such as Kerpoof in language activities with a group or class. Note that the IWB connects to the laptop with 2 cords, VGA (blue) to show the display, and USB (black) to make the connection so that it is possible to interact with the website by touching the board. 2. Use the IWB to run activities designed for the IWB. Each type of interactive whiteboard comes with software designed to make interactive presentations and lessons for use with the board (e.g. SMART Notebook, ActivInspire). These have a bit of a learning curve but there are tons of videos available on YouTube that will teach you to make activities targeting categorization, sequencing, concepts or other skills. If you are going to be working in a room with an IWB, it would be a good idea to start getting familiar with these tools (again, free if you have the board), because you can make CUSTOM activities for your group. Also, rather than reinvent the wheel, each kind of software has activity exchange sites you can use to download files that you can use with a class; Scholastic also has a nice set of activities available, particularly those targeting storytelling and narrative. Laptop connected to interactive whiteboard running "Notebook" activity. Again, note the necessary USB and VGA connections. 3. Display your iPad on the IWB. Note that I wrote "display." You can display any app on an IWB after connecting it to the board's VGA (visual) cable using the necessary adapter. However, to interact with the app, you will need to touch the iPad screen- NOT the board. This is because your iPad does not have a USB port that is necessary to convey the touch connection from the board. Still, displaying iPad on an IWB can be really fun and useful with a class. You just might want to make sure there is some way (iPads available to class, etc) to give the kids access to the app later, because they pretty much ALL will want it. iPad displayed on IWB with the app Felt Board. Note that the USB cable has no place to go and dangles there sadly. You'd need to touch the iPad to make your scene. 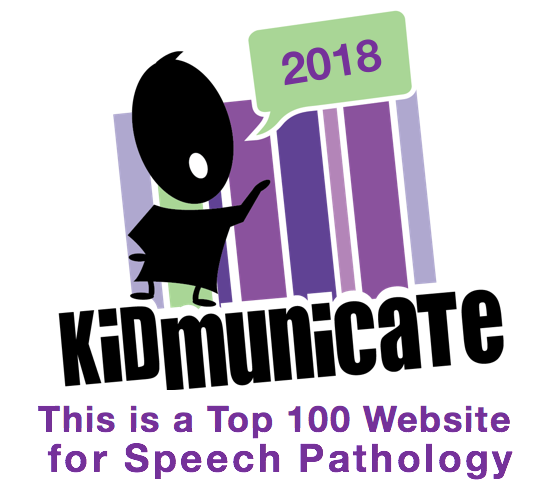 Our Essential Tech for SLPs website has a great list of resources created by my pal Laura Goehner, an SLP with an IWB. Alex Dunn's SMART Inclusion site has tons of resources about using SMART boards in Special Education. My video on sharing your iPad screen with a group includes a piece on IWBs. SMART now has an iPad app- I haven't even checked it out, but will soon. Language Adventures updated with new content! Scribblenauts Remix! I have been meaning to feature this app for sometime, and if you can't get your card, it is well worth the $.99. Scribblenauts Remix is an iVersion of a classic Nintendo DS game that some of your students may have played in the past. 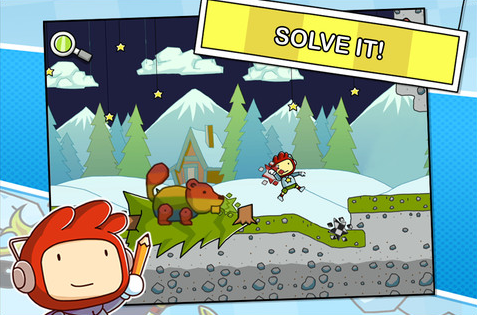 It is basically a problem-solving game in which the character, Maxwell, is placed in various settings and faces a challenge. You need to decide which objects from the app's HUGE library of items to place in the setting to help him meet the challenge. Objects are animated and responsive to your modifiers, so for example, a "huge bunny" will be huge and an "angry bunny" will be aggressive. "Rainbow" was probably not necessary for this challenge. The puzzles will be challenging (in a good way, requiring your scaffolding) for children with language difficulties. Timing does not become a factor until late in the game. When using games such as this with students, it is helpful for you to have a walkthrough (basically, the answers), so here is a good resource for that. 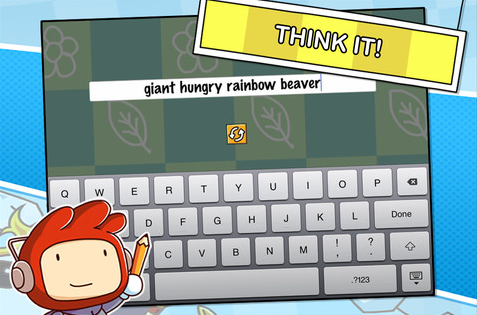 BUT, one of the great things about Scribblenauts is the way it promotes creative thinking and problem solving; there is not just one way to solve any of the levels. Description: adding attributes changes items, all items serve a function that can be described as well. Story Grammar: the character of Maxwell is in various settings and faces problems, etc. The playground can also be used to develop the concept of setting and items inherent to settings. Causality, Conditionality, Prediction: use language around why objects should be added, what would happen if they were added. Social Learning: when kids work together to play this game, many "teachable moments" ensue! [EDIT From Hanna B] Articulation- gear additions of objects around a particular sound.